Published in the Dover Express, 21 November, 1980. The reservoir, called the higher reservoir, situate between the wells and the Old Castle Hill, was completed in November, 1854, and the Mayor, Mr. William Henry Payn, celebrated the conclusion of the work with a Municipal banquet, served in the reservoir, which, for the occasion, was transformed into a dining hall, gaily decorated with flags. A view of the reservoir as it appeared during the banquet is hung on the walls of the Council Chamber. A hundred gentlemen dined with the Mayor at the opening banquet, and the speeches were brightened with hopes suggested by Dover's new sanitary prospect. The reservoir is 108ft. long and 24ft. wide, the covering being supported by 15 Gothic arches, and it has a capacity for containing 500,000 gallons. When full, the water level is 232ft. above sea level. 206ft. above the surface of the Market Square, and 154ft. above the London road at the Gate Inn, Crabble Hill. Five or six years’ experience proved that the works, although admirably situated, and well supplied with the purest water, had not sufficient reservoir space to ensure the town against a breakdown of machinery; while the yield of the wells and the pumping power were not equal to the demand for water. An enlargement was undertaken in the year 1862, the additional work's consisting of a new boiler, alterations in the pumps, a new reservoir to hold a million gallons, and one hundred yards of additional heading at the bottom of the wells. The boiler and alterations to the pumps, by Simpson end Co., cost £1,400; and the construction of the boiler house, the reservoir, and the driving of the heading, £5.516. As the new reservoir was on a lower level, west of the wells, the cost of pumping into it was reduced, so that the improved pumping plant was capable of raising three million additional gallons per week, which quantity the extension of the headings secured. Even with these enlarged works, it was found to be impossible to give the town a constant supply of water. This was owing to waste; and the discussions which took place in. the Town Council showed that leakage, from the beginning, had been extraordinary. When the works had 'been in operation but a little more than a year, Mr. Hawkesley was called in to report, and his opinion was that more than half the water pumped was running to waste. When the works were first opened, and only a few houses were connected with the mains, there was, for a short period, a constant supply; tout in 1853, when there were but 500 houses connected, the supply had to be made intermittent, and for many years, four or five hours’ supply out of the twenty-four was all the works could afford. The great cause of waste was a defective class of water-closet fittings, which the Council had then no power to control: another source of leakage was iron service pipes, which quickly corroded and allowed the water to run away unseen into the shingle, which underlies many of the houses; and the intermittent system itself was a cause of waste, for, when the water was off, the taps were left open, so that when it was turned on at the works, it ran to waste in every direction. Ten years after the enlargement of the works, in 1862, the weekly supply rose to 8,000,000 gallons per week, which was the fullest possible output, and the Town Council had to face the necessity of again extending their works or largely reducing the waste. The Council then made a serious attempt to stop the leakage by the appointment of additional inspectors. This action was so effectual during the next ten years, that in 1882 the weekly supply had been reduced from 8,000.000 to 6.000,000 gallons, notwithstanding the large number of houses that had been connected with the mains during that time. This was regarded as a satisfactory result, but after twenty years' work, the machinery again needed supplementing. In 1882-3, a third engine and engine house were erected, a third well sunk, supplied with an improved pump, and the west-south-west heading extended, making its length 197 yards. 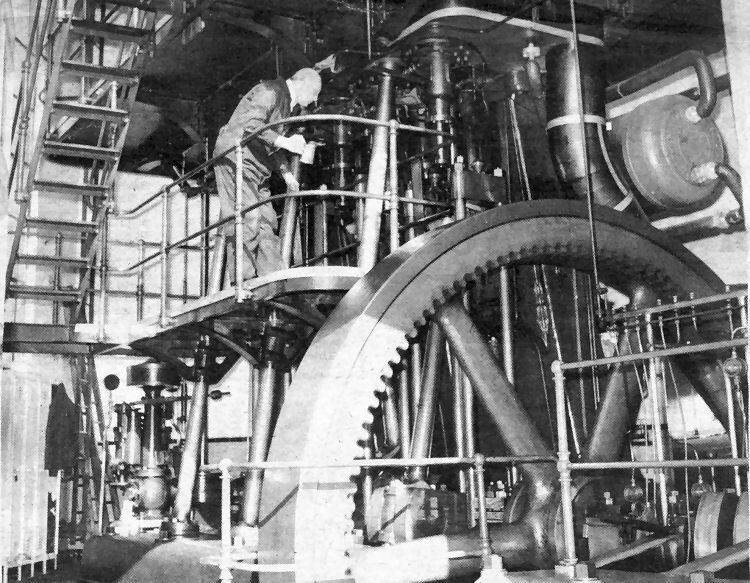 The new engine, of 90 horsepower, was supplied by Messrs. James Simpson and Co. Ltd.. of Pimlico, who bad constructed all the engines and pumps at the Waterworks from the beginning. It had a powerful stroke, and was capable of raising 72,000 gallons per hour. Visitors were fond of standing over against this latest engine house, watching the great beam and rods steadily engaged in their monotonous task. Each stroke of that great beam brought up 72 gallons of water. That, according to the average domestic supply, allowed sufficient water for three persons for ore day at each rising of the beam, therefore that great beam would have to rise more than 13,000 times to meet the daily needs of Dover's 40,000 inhabitants in the early part of this century. As water was needed also for trade, sewer flushing and street watering purposes, not only the great engine put down in 1882, but also the two older ones were necessary to keep the town and port fully supplied. The additional works of 1882 did not carry the establishment to finality. In course of time, the older engines needed overhauling, and the yield, as well as the storage space of the wells and headings, had to be increased. This work was taken in hand by the Borough Engineer, Mr. H. E. Stilgoe, in the year 1899, when the two original engines were re-constructed by Messrs. Simpson and Co. That placed the pumping power on. a proper footing; and to increase the yield, in 1899 Mr. Stilgoe extended the westerly heading an additional 28 yards; and in 1895-6, he drove another heading 106 yards in a north-easterly direction, increasing the yield of the wells to 1,700,000 per day, and giving the headings a storage capacity of 230,000 gallons, which (together with the continual supply from the springs) enabled the pumps to have an uninterrupted run of five hours at their full speed. One of the powerful steam engines which for years pumped Dover’s water supply from natural underground reserves to the man-made reservoirs at the Connaught Road waterworks. The engine and its identical twin are being preserved by enthusiasts. 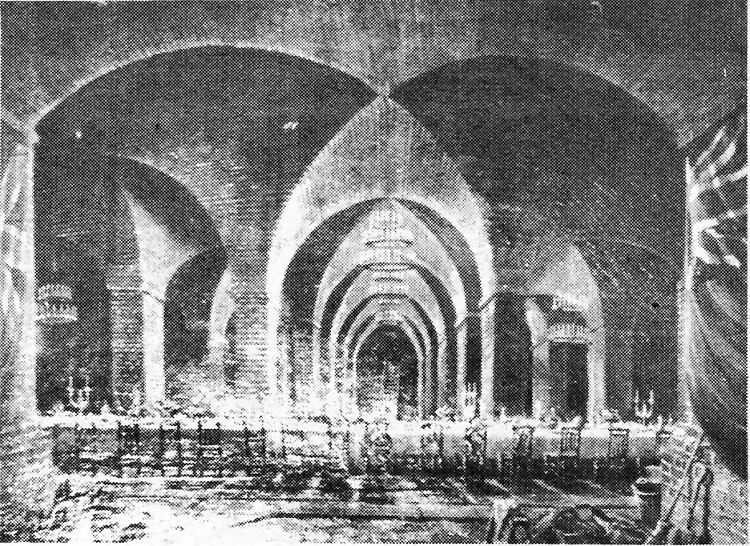 The picture above depicts the interior of one of the reservoirs in November 1854 when a mayor’s banquet was held there to mark its completion.